Students listen to a speech by Keliann Nash at the Speech and Debate Showcase. 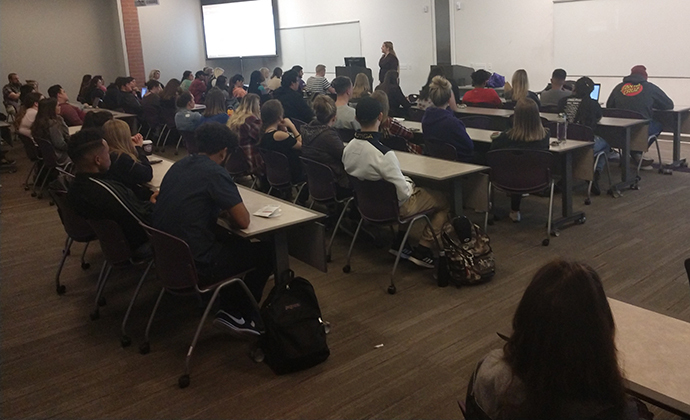 Members of the Grand Canyon University Speech and Debate teams presented a lively showcase Wednesday evening for an audience of approximately 60 students. 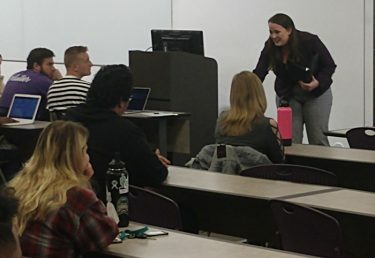 Brian White, Tommee Gleason, Xanthia Clow and Keliann Nash delivered speeches, and Joseph Madere, Matthew Calderwood, Benjamin Streubel and Lexi Baskin participated in a mock debate about various aspects of campus life. Nash prepares for her speech. Prompted by a moderator posing topics, the debaters showed the ability to think and speak with no preparation time. Gleason, who placed third in three events at the Pacific Southwest Collegiate Forensic Association Fall Championships on Sunday at Mt. 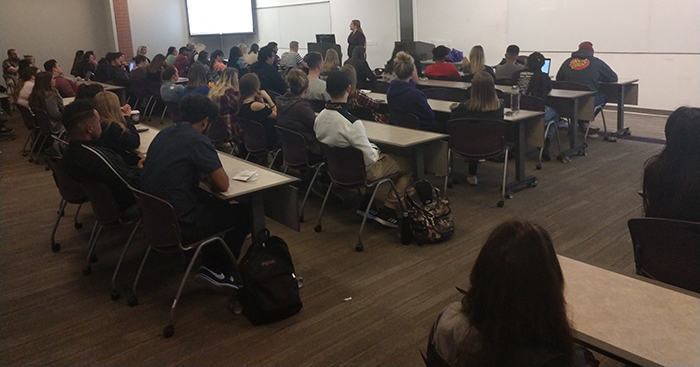 San Antonio College in Walnut, Calif., showed the audience his quick preparation and writing skills by writing a speech about United States-Saudi Arabia relations on his computer – projected on the large classroom screen for all to see – and then he performed the speech. Nash ended the event on a passionate note, with a moving performance she dedicated to her brother, who dealt with the need for males to properly express emotions.